Why does a phone need a 41MP camera? A pixel count of 41 million in a smartphone like the Nokia 808 PureView may seem more than a little excessive, but Nokia claims it will mean less noise, not more. While cramming more pixels onto the sensor in theory enables a camera to record more detail and allow larger prints to be made, there is also usually a downside in the form of more image noise. If the sensor size is to remain the same, squashing more pixels on to it means that the photo receptors must be made smaller. This means that they gather less light and generate a weaker signal which must amplified more to create an image. A weak signal and heavy amplification or gain results in more image noise. This is one reason why many professional photographers favour full-frame cameras such as the Nikon D800 with sensors that are the same size as a 35mm film frame. The larger size of the sensor means that the pixels (or photo receptors) are bigger than smaller format camera with the same pixel count. With a total pixel count of 41million the camera in the Nokia 808 PureView at first glance would seem ripe for producing very noisy images in low light. However, Nokia claims its 'pixel oversampling' technology enables it to produce much cleaner images than we might expect in low light. Essentially pixel oversampling is 'pixel binning' and it links several pixels together so that they are treated as a single 'super' pixel. The stronger signal generated by this super pixel requires less amplification so that the image suffers from less noise. The benefit of using more small pixels rather than fewer larger pixels is that the sensor should be better able to resolve detail. It also means the system is flexible and in bright light when noise is less likely to be an issue, higher resolution images can be created with less (or no) oversampling . Like other digital cameras, the 808 PureView has an effective pixel count that is lower than its total pixel count. 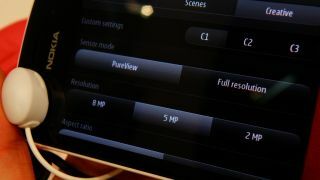 In 4:3 format mode it uses 38 million of the pixels on the sensor, while in 16:9 modes images use 34 million sensor pixels. However, in its default settings pixel oversampling means that 16:9 images from the 808 PureView have 5 million pixels. Nokia uses a form of digital zooming in the 808 PureView camera and a smaller area of the sensor is used to create the image as the user zooms in. Pixel oversampling is still employed, but as the number of pixels in the imaging area decreases, the oversampling is reduced. The maximum zoom level is reached when the number of pixels within the active sensor area equals the selected image size. Hence in the default 5Mp (3072x1728 pixels) setting the maximum zoom level is reached when there are just 5 million pixels making up the image and no oversampling is taking place.